The What: Crestron has launched the Flex B100 Series, a front-of-room, wall-mount UC smart soundbar that provides native Microsoft Teams and Skype for Business functionality in a practical design. It will make its debut at Microsoft Ignite 2018 event in Orlando, FL, September 24–27 at Crestron’s booth 1707. The What Else: With powerful built-in speakers, the Crestron Flex B100 Series fills meeting spaces with clear audio. Conversely, its beamforming microphone array picks up voices in the furthest reaches of the largest spaces. The embedded Huddly IQ videoconferencing camera provides technology developed in partnership with Intel that includes 4K digital auto-zoom, an undistorted, ultra-wide viewing angle of all videoconference call participants, and people counting. The Crestron Flex B100 Series benefit from zero-touch deployment via the Crestron XiO Cloud platform. With Crestron XiO Cloud, organizations can easily deploy, manage, monitor, and evolve thousands of Crestron Flex devices from a single dashboard, resolve technical issues remotely, and gather actionable space and device usage data, all without the need for programming. 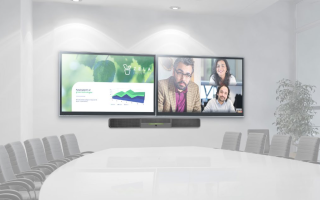 The Bottom Line: The Flex B100 is designed to combine professional-quality audio and video with the flexibility to transform traditional, more complicated meeting spaces into easy-to-use spaces free of table clutter. Crestron Flex solutions deliver a simple, consistent user experience in all the places people work, from individual workstations to boardrooms.